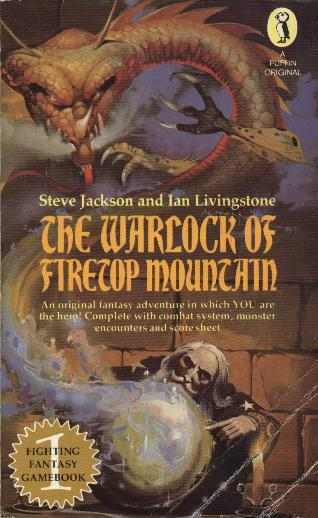 When I was 12 years old I discovered “Fighting Fantasy” books, perhaps the most famous and best loved of these being the “Warlock of Firetop Mountain”. I spent hours going through these books, making decisions, trying to solve puzzles, captivated by the immersive world they created – I wish I had kept them! The ability to be able to “play” a story was an amazing concept to me at the time and I remember trying to create my own “Fighting Fantasy” adventure during one cold, wet summer, hampered only by a complete lack of ability to either draw or write. Round about the same time I started to toy with “text adventures” on my Vic 20/Commodore 64. I didn’t get out much when I was 12. Fast forward 30 (!) years or so. 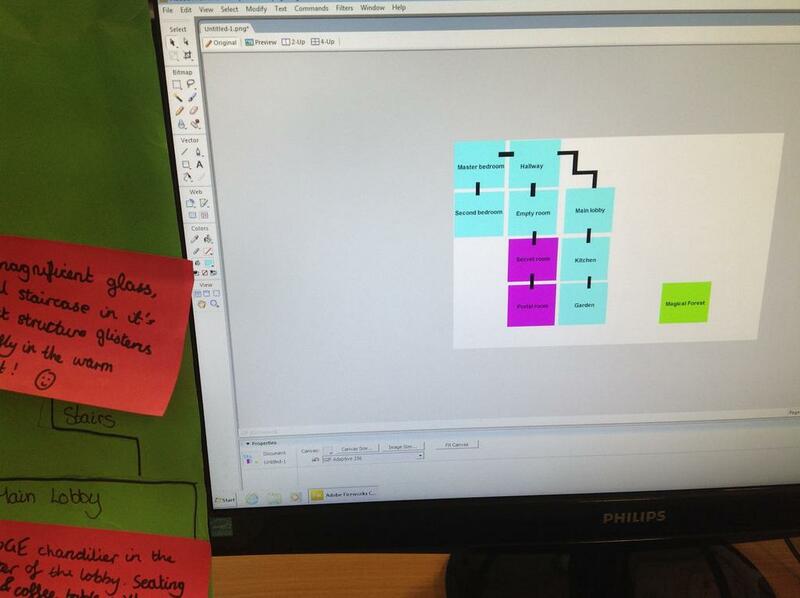 I am about to finish teaching Interactive Fiction to a group of Year 7 and Year 8 students. It is increasingly becoming my favourite lesson of the week. Interactive Fiction. Sounds cool, doesn’t it? Less geeky then “text adventures” and creating a less worrying mental image then “Fighting Fantasy” might to the unenlightened sceptic. IF (as it shall be known henceforth) is the term to describe the Fighting Fantasy/Text Adventure method of storytelling, where the reader interacts directly with the world within the story and their decisions influence the outcome. Once my 12 year-old self had got over the shock that he would become a teacher, he would be amazed that such a thing could be taught in school and that (horror) there may be ACTUAL EDUCATIONAL BENEFITS as well. So, without really knowing what I was doing I started teaching it. A year or so later, I’m getting a little better at doing that and I am loving it more each time I teach it. Here are some of the reasons why. And did I mention the zombies? Students HAVE to write descriptively, as they create a world from nothing and fill it with people, places, creatures and things from their own imaginings. Consider the fun I had playing a game last week that two boys had written and getting to type in EXAMINE ENTRAILS…. For the benefit of sensitive readers I won’t share with you the description that boys had provided… I would love to see how an English teacher would approach IF and I think it would soar as a cross-curricular project delivered with ICT and English. The students wanted to do more. They wanted to make maps and put them into their Quest games. So I pointed them towards Adobe Fireworks and off they went. (Imagine combining IF with Google SketchUp and BUILDING the world that they describe! ) They wanted sound effects so when they couldn’t find them on the web, they recorded their own and edited them in Audacity. Arguably a cleverer teacher than I could have done more with the mapping element and I am sure that this would work as a cross-curricular project with Geography as well. Since YouTube clips can be added to Quest games, there is also the scope to get students to record little bits of drama, upload them to YouTube and use them in their games. The Enrichment groups are made up of Y7 and 8 and it just seemed obvious to get the students to work in mixed groups. The students are very good at this, and the fact that we have a vertical mentoring system doubtless plays a part. They worked in groups pretty much from the start, planning and discussing their ideas and mapping things out before they got near the computer. I found that the topic lent itself to this as there seemed to be clear roles emerging. Working on a Quest game provides the opportunity for real collaborative group work. Dylan Wiliam has spoken of the need for students to have clear roles and shared goals when working in groups and Quest is perfect for this. Some of the students took on the role of cartographer, some were graphic designers, others would lead on the programming and teach other students when they were in need of help. I have increasingly tried to encourage them to work independently when finding their way troguh Quest, and to draw on each other for support. I have made some video tutorials (they’re not brilliant but they can be found here if you’d like to check them out) and I have found that after the first few lessons I do very little “teaching” as such. Of course, occasional refereeing is needed (they’re kids, it’s last period on a Friday..) but on the whole, my role has been more about supporting, questioning and encouraging. The fact that we deliver this in Enrichment has made it a joy to teach. Tempting though it has been to move into the KS3 ICT course, I have avoided doing so There are no grades or levels in Enrichment. We don’t have targets to work to and it creates an opportunity to take the lessons where we want to. 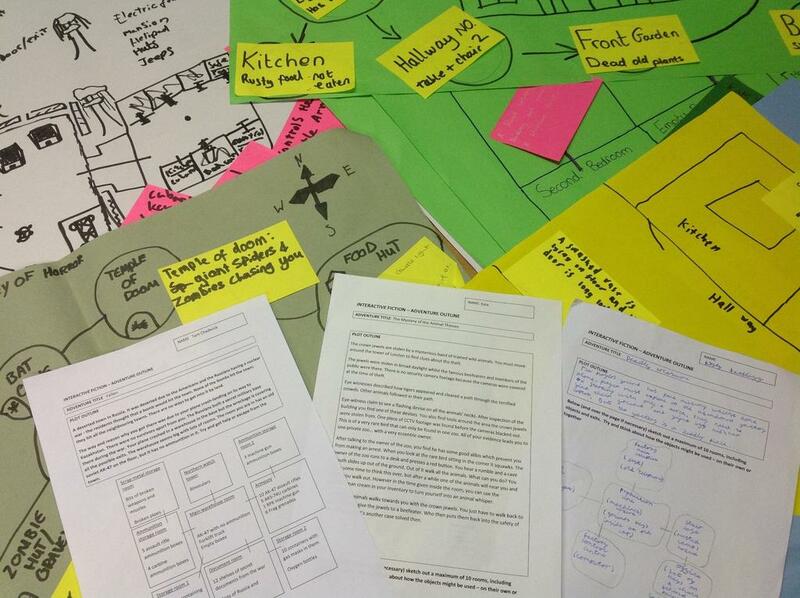 Don’t get me wrong, we have a scheme of work and we do plan lessons – I have had a formal lesson observation teaching IF – but for me there is a tangible feeling of freedom that I think the students pick up on too. There is TONS of assessment going on – peer and self-assessment happens all the time. We use Socrative – especially near the beginning when we are skill building – to help them measure their own progress and to help me judge how much they need from me as a teacher. In fact if you REALLY want your students to get feedback, why not get them to upload their games to the website for others to play? To make things work in Quest, students need to use SCRIPTS – for example they would need to write a script to handle a locked door, or a key hidden in vase, or a zomb – actually better not mention that one. It’s programming by stealth. We found last year that IF provided lots of useful information as to the students that might be invited to start GCSE Computing in Year 9. It certainly sparked an interest in programming in a number of students. This entry was posted in Teaching & Learning and tagged Collaborative Learning, Enrichment, Group Working, Interactive Fiction, Quest by gripweed1. Bookmark the permalink.